New home study fishkeeping course in the October issue! We've been working really hard here in the Practical Fishkeeping office to bring you a five-part home learning course on the basics of fishkeeping, which kicks off in the October issue. And what's more, at the end of the course you'll have the opportunity to take a test to see if you qualify for a special Fishkeeping Diploma! 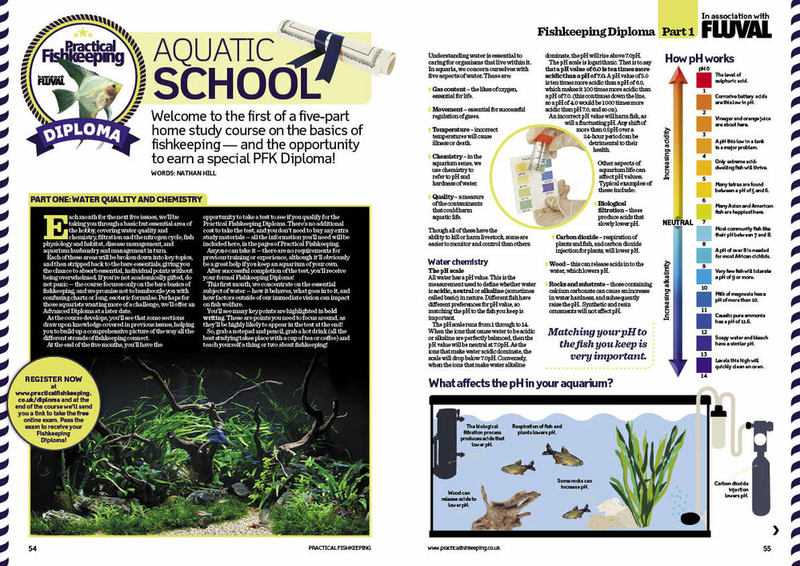 Our fantastic Aquatic School series is brought to you by PFK in association with Fluval. Each month for the next five issues, we'll be taking you through a basic but essential area of the hobby, covering water quality and chemistry, filtration and the nitrogen cycle, fish physiology and habitat, disease management, and aquarium husbandry. There's no additional cost to take the test, and you don't need to buy any extra study materials - all the information you need will be in the pages of Practical Fishkeeping. This first month, we concentrate on the essential subject of water — how it behaves, what goes in to it, and how factors outside of our immediate vision can impact on fish welfare. Make sure you don't miss the first part of this essential new series. 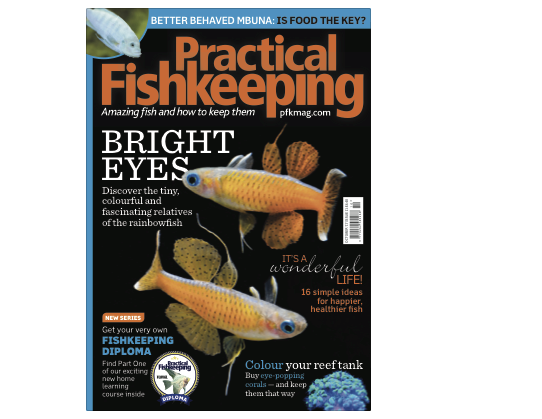 Buy the October issue of Practical Fishkeeping online today (free 1st class postage if you live in the UK) or check out our latest subscription offer and get two year's worth of PFK for the price of one! For more information on the great range of Fluval products, which include the award winning FX6 filter, click here. Fluval's award-winning FX6 external filter (top) and its new baby brother, the FX4. Buy a year's subscription to Practical Fishkeeping — and get a second year FREE! Save up to 50% a year when you subscribe to Practical Fishkeeping magazine today. Yes, you read that right! 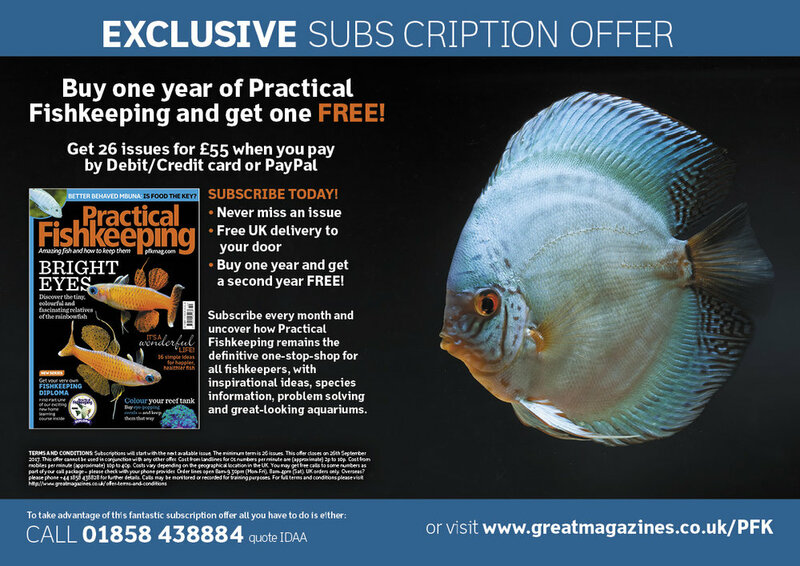 Take advantage of this fantastic subscription offer and you'll get 26 issues of Practical Fishkeeping for £55. That's a whole year's subscription for FREE, when you pay by Debit/Credit card or PayPal. Save up to 50% a year and subscribe to Practical Fishkeeping magazine today. Enjoy the benefits of having a print subscription delivered straight to your door with FREE UK delivery! To find out more, click here. Offer closes on September 26, 2017. October issue of Practical Fishkeeping on sale now! Our fish of the month are the beautiful blue-eyes. With irises as enchanting as a galaxy, and flowing fins like Spanish dancers, these are fish you really need to keep! After a decade of longing, former PFK editor Jeremy Gay finally gets the chance to keep one of the most beautiful tetras out there. Meet the Red/blue Peru. We offer 16 simple ideas to enrich your fishes' lives to make them happier and healthier — and find out how the way we feed could be the key to better behaved mbuna. Ever fancied taking a home learning course in aquatics? Now's your chance. Our new Aquatic School series begins this month. 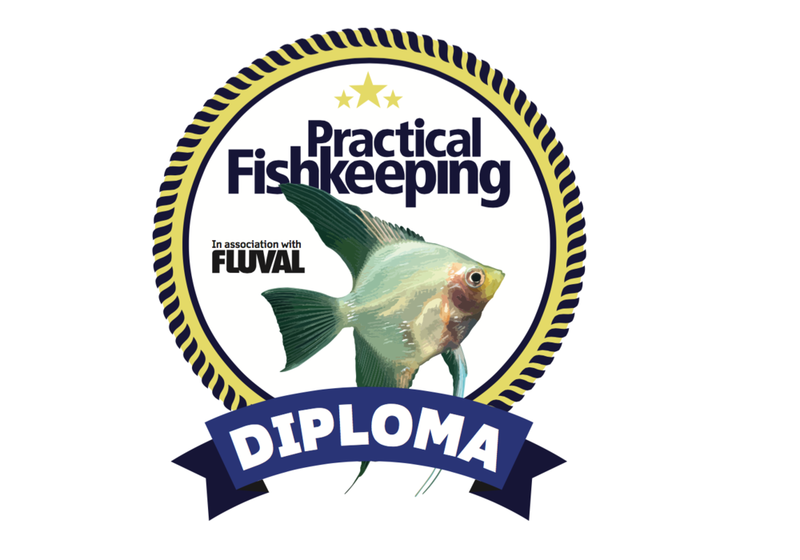 Over the next five issues you can learn all about the basics of fishkeeping — and at the end of the course you can take an exam for the opportunity to earn your very own Fishkeeping Diploma! Whether you're looking for a Jedi mind trick, are seeking Superman, want Utter chaos, or something more discreet, you'll want to keep the colours of the corals you're buying at their very best. We explain how to do it. The predator vs. prey relationship has given rise to some convincing mimics, which can give marine aquarists a rare insight into this evolutionary 'arms race'. Find out more in the October issue. All this, plus some great oddball fish we discovered on a recent shop visit, a lovely community tank based around a Guyana stream, a Bolivian catfish showcase, readers' tanks, advice on quarantining Koi, and how you can add water movement to your garden with a stream or waterfall — even if you don't have a pond! All this and loads more in the October issue of PFK. On sale now. Buy the October issue online today — and get free first class postage if you live in the UK! Or why not check out our amazing subscription offer? 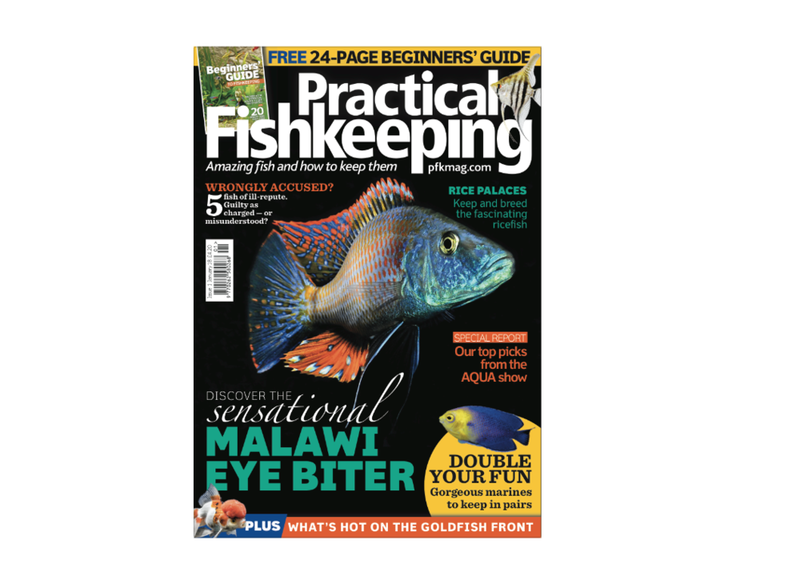 Buy one year's subscription to Practical Fishkeeping and get a second year FREE! Have you voted for your top aquatic shops yet? Time is running out for voting in our 2017 Practical Fishkeeping Readers' Poll. So, if you haven't cast your vote for your favourite aquatic retailer(s) yet, now is the time to do so! And don't forget that there are some fabulous prizes up for grabs from Fluval — just by taking part, you'll be entered into a free draw where you could win some great fishkeeping gear! Entries must arrive before August 18, 2017. The results will be announced later in the year. Click here to vote and to find out what you could win! September issue of Practical Fishkeeping on sale now! In the September 2017 issue of Practical Fishkeeping, you can discover some of the brightest freshwater fish out there, and what makes them even more special is that you can grow them at home from mail order eggs — they’re the fishy equivalent of garden seeds! Find out why the Flyer cichlid makes a great introduction to Central American cichlids, and earn your breeding stripes by spawning the Zebra danio. We explain how to go about it. We have some great inspirational ideas for three-foot tank set-ups — or alternatively, why not go ‘scape hunting? The concept is simple: go out, explore, be inspired, then use your experience to create an aquascape. We revisit the star of one of this year’s most popular PFK reader visits, and bring you more rarities and curiosities encountered on our travels recently. Discover how you can add variety to the diet of your fish, shrimp and snails, and save money into the bargain. And there are more ways to save money with our outdoor project ideas — so go on, make the most of the rest of the summer. It won’t last for ever! We look at the arguments for and against keeping the remarkable Cleaner wrasse in the aquarium, and if that new marine fish you added acts nothing like you expected, or a peaceful fish has become a tyrant, our special feature explains what may have caused these changes in behaviour? All this plus your questions answered by our team of experts, the latest products tried and tested — and much more. August issue of Practical Fishkeeping on sale now! Did you know you can now buy single issues of Practical Fishkeeping online, at no extra cost — postage is free if you live in the UK? Buy the latest issue today! Our fish of the Month is the Rainbow shiner — it’s ironic that one of the hottest fish on the scene comes from cold waters... Here’s how to keep this little beauty. Who says brown is boring? The Chocolate gourami is a real treat that not only looks delicious but also has a soft centre. Find out how to keep these sweet fish. Smaller set-ups can really look the business. We have are some great ideas for the more easily accommodated 60cm/2ft aquariums. Charming and colourful, neither of the Ram cichlids grow too big, and they are inexpensive to buy and fun to breed. But one is much easier to keep than the other… Find out which is best for your tank. We feature a lovely Nature Aquarium style layout, set up to honour aquascaping legend Takashi Amano — and it’s surprisingly low maintenance. We visit a reader with a superb reef set-up that shows just how effective a room divider tank can be when it’s done well. There’s advice on prepping for the hols, preventing summer problems in your pond, and how to make the most of the summer by enjoying our native marine life. Plus some stunning new fish in the shops, new gear reviews, your questions answered by our team of experts, and loads more. Don’t forget you can buy the latest issue of the magazine online, with free p & p if you live in the UK. Or why not subscribe to PFK? See our latest subscription offer here. 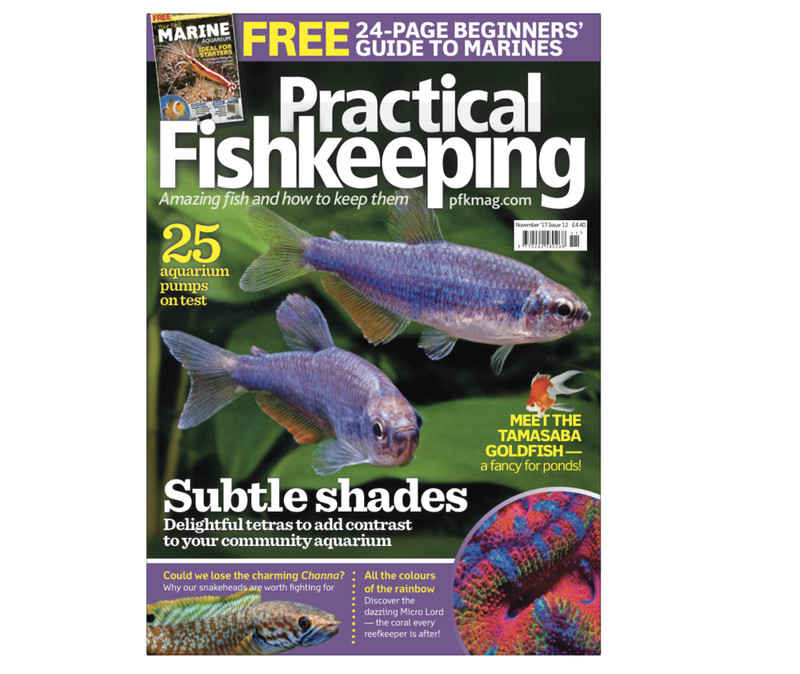 Get three issues of Practical Fishkeeping for just £3! Yes, that’s right! Subscribe to PFK and you can get your first three issues for just £1 each! Choose from a print only subscription, or go digital only. Or you can even opt for both and save even more money. Free UK delivery to your door or free download to your digital device. Hurry — this offer closes on August 1, 2017. Practical Fishkeeping has just launched its 2017 Readers’ Poll to find the UK’s best aquatic shops. But this year we’d like to take it a step further and ask the retailers to tell us about their amazing shop staff for a new PFK award. If you have a member of your retail team who you think really deserves recognition, we want you to let us know. Maybe they’re super-knowledgeable in their field, have decades of experience, or go above and beyond what’s expected of them. Perhaps they’re talented aquascapers, amazing with customers, or a whizz when it comes to your social media pages. Whatever makes them the best, we want to hear about it. Send us an email with up to 500 words and a photo of the member of staff concerned, explaining why you want to nominate them. Feel free to include any customer feedback. From these, we’ll draw up a shortlist, and we may even feature some of them in-mag or online. We’ll then want to speak to those who make it onto the shortlist — either over the phone or in person — as well as the individual who nominated them. This should give us the additional information we need to help us decide the PFK aquatic salesperson of the year, which will be announced in a forthcoming issue of the magazine. There will be prizes for both the winner and the runner-up. Send your emails to karen.youngs@bauermedia.co.uk with the subject of ‘top shop staff’. The closing date is August 17, 2017. Vote for your favourite aquatic shop! Share the love! Vote for your top shop in the Practical Fishkeeping Readers' Poll. We want you to vote for your top aquatic retailers in the Practical Fishkeeping Readers’ Poll — and just by taking part, you could win a great prize, courtesy of our sponsor, Fluval. Great aquatic shops deserve your support — so if you know of a retailer who offers fabulous fish, first class customer service or has amazing staff, here’s your chance to shout about it and give something back for service that’s gone above and beyond the expected. Receiving a PFK Readers’ Poll award is the highest praise for an aquatic shop and every vote counts — and the result depends entirely on you, the PFK reader. Your votes are important, so as a thank you, we will automatically put your details into a prize draw where there are £400-worth of Fluval aquatic products to be won courtesy of our sponsor, Rolf C. Hagen. Click here to vote and to find out what you could win. Herbert Axelrod, pictured with another of his great passions — the violin. Image: Barcroft Media. Dr. Herbert Axelrod has died at the age of 89. Nathan Hill looks back on the life of the ichthyologist, author, explorer, entrepreneur, philanthropist and publisher with a controversial history, who once dominated and then receded from the hobby. The author and publisher Dr. Herbert Richard Axelrod passed away at his Swiss home on May 15, 2017, with tentative reports trickling out over the subsequent days — articles from online Violin publications followed word-of-mouth announcements between friends of those close to him. In most camps, the news has been greeted with sadness, while some of those with whom he collided throughout his life have been less morose: in death, as in life, Axelrod is divisive. Axelrod’s history is as coloured as it is cloudy. Sections of his youth are undocumented, while periods of his adult life lack corroboration. He was born June 7, 1927, the son of Russian Jewish émigrés. His mother worked with the US Navy Procurement Office, while the interests of his father, a violin and maths teacher, would have great effect on Axelrod’s own life choices. Little is known of his school years, though there are hints of adventure. At 10, it was claimed that he swam the fifteen-mile width of Lake Ontario; a suggestion of the derring-do that would drive him through life. His family wasn’t a wealthy one, and Axelrod would gain a little spending money catching crabs and selling them to Chinese laundrymen. He had an obsession with pigeons, the messy nature of which led to angry landlords ousting the family from their lodgings. At 17, Axelrod joined an Army Specialised Training Program to study a pre-medicine course. By the age of 23 he was serving in the active war in Korea, assigned to a M*A*S*H unit. It was during this time that one of his first, dramatic claims arises. Whilst in Japan, dropping off blood and collecting whisky to trade with his fellow servicemen, he had a chance encounter with an ichthyologist in a Tokyo library, Dr. Takiharo Abe. After Abe introduced him to a book by Emperor Hirohito — an ardent marine biologist — Axelrod pointed out an error in the scientific name of a nudibranch. It turned out that Abe was well connected, and cleared a pathway for Axelrod to meet the Emperor Hirohito. On orders from his military commander to respond to an invite from the Emperor himself, Axelrod and the Emperor then spent a week together collecting the nudibranchs of which the Emperor was fond. During his Korea years Axelrod received an unspecified wound to his hands, which in turn drove him to the career with which we fishkeepers mainly associate him. In an attempt to restore his dexterity, he took to typing, directing his words at a subject he knew and loved — fishkeeping. Returning from Korea, Axelrod eventually completed studies for his Ph.D in Biostatistics, to join his Master’s degree in Mathematics. During this time, he claimed to have attended lessons given by Albert Einstein, who was at that time teaching lattice theory at nearby Princeton. The timescales and geographies of the parties involved make this more than plausible. In tandem with study, he started to produce the magazine Tropical Fish Hobbyist, first published in September 1952. Tropical Fish Hobbyist was an opening for Axelrod, and by 1955 he had founded TFH Publications Inc., a huge publisher of pet-keeping books and magazines. Among his titles, several of which are still found as reference books sold and used by retailers around the world, is his Handbook of Tropical Aquarium Fishes, which may represent one of the most successful fish books of all time, selling well in excess of one million copies globally. 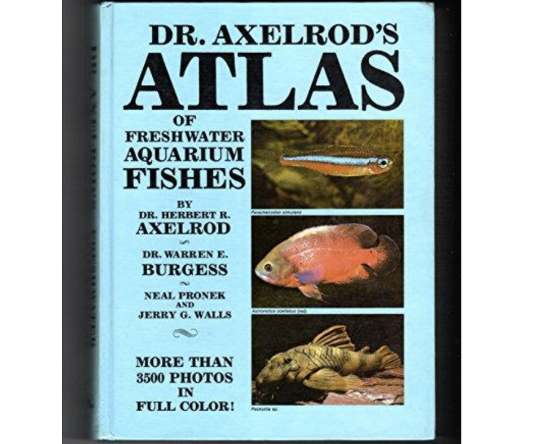 Dr. Axelrod’s Atlas of Freshwater Aquarium Fishes, last printed in 2004, probably still ranks as the most recognisable fish title for aquarists. Publishing wasn’t Axelrod’s only source of income. As time progressed he invested in fish farming, owning no less than five tropical farms near Tampa, as well as inventing scores of products we take for granted today. Freeze dried worms, for example, were originally an Axelrod concept. Dog owners may be surprised to find that the Nylabone their pets are chewing was also one of his creations. TFH also afforded Axelrod some personal indulgences, such as the sister publishing company Panganiniana, producing musical-themed publications that allowed an outlet for Axelrod’s love of violins. Throughout his life, he was an amateur violinist, as well as a collector and trader of rare violins. The runaway success of TFH Publications afforded Axelrod free time to do what he pleased, and what pleased him was exploration. With energy to spare and ample funding, he ventured around the world, starting with the rainforests of South America. While seeking out fish, Axelrod still found time to brush shoulders with extraordinary characters. In 1960, he took the former King of Belgium, Leopold III, on a spear-fishing expedition into the Amazon. Somewhere in the late 1950s he procured Jaguars for Walt Disney. The Jaguar brief was for two black cats — potentially those seen in Disney’s ‘Jungle Cat’ (1959) — but given that Axelrod couldn’t find any truly black jaguars, he trapped and sedated a normal one, before hurrying it to a Manaus hairdresser for an all-over dye. There was even mention at one stage that Axelrod advised Churchill on goldfish, though this does seem to have been refuted. The mid-1950’s marked the beginning of another of Axelrod’s fishkeeping legacies — the number of fish named after him. Regardless what genera of fish you keep personally, chances are that Axelrod’s hand is somewhere in your collection. The first fish named after him was both the most famous and the most controversial. The Cardinal tetra, Paracheirodon axelrodi, a fish known of since 1953 was due to be described by Drs. George Myers and Stanley Weitzman in the University of Stanford Ichthyological Bulletin. Allegedly finding Cardinals in a local retailer, Axelrod bought some of the fish and gave them to L. Schultz for a hasty description, which then appeared in an article in Tropical Fish Hobbyist one day before the publication of the Bulletin. In keeping with nomenclature laws, the first published name takes precedent, and the fish we have gained its name from Schultz’s description. It was, by a factor of just one day, originally to be Hyphessobrycon cardinalis. Axelrod’s fish discovery years were prodigious, bringing hundreds of new species to the hobby. 16 species and one genus are currently named after him, though there were more. At one stage, he had a Discus named after him; lost to a taxanomic clean up. As well as journeying to find fish firsthand, it was Axelrod’s benevolence that funded the likes of Dr. Jacques Gery and Dr. Martin Brittan to trek for new and exotic species. It was Axelrod, along with Willi Schwarz, who set up the Cardinal tetra industry of Barcelos back in the 1950s. Given that the Cardinal accounts for 80% of artisanal fisheries in that region, Axelrod’s impact on the region and its subsequent conservation was great. In recent years, Project Piaba continues the legacy of Axelrod — a project he donated heavily to in the 1990s, leading to the development of the Centre for Aquatic Conservation. Reportedly, Axelrod was once asked by the then President of Brazil, Humberto Castelo Branco, to help draw conservation plans for wider swathes of the Amazon. Charity and philanthropy was a recurrent theme in Axelrod’s long life. In 1989, he donated fish fossils to the University of Guleph; at the time, likely the single largest donation ever received by a Canadian University. Six months later they had established the Axelrod Institute of Ichthyology in his honour. He was busy donating to the violin world, too. Over his lifetime, he built up one of the largest collections of Italian violins, loaning them to virtuosos as he saw fit. Within music circles he donated tens of millions to orchestras, operas and academies. In 1997, the Curtis Institute and New York’s Juilliard School hosted a party for his 70th birthday, at Carnegie Hall, and with an all-star cast. In 2003, donations to museums in Vienna brought him the gift of Austrian citizenship, which he later put to use during a darker phase of his life. His philanthropic fame — he was once ranked as one of the top benefactors of America in the Chronicle of Philanthropy — was overshadowed in April 2004 when Axelrod became a headline name for a different reason: He had been indicted on charges of conspiring to defraud the US government. It was alleged that he had filed false tax returns, as well as diverting money into a Swiss bank account. The aquatic and violin worlds collectively clammed up in horror. Axelrod failed to appear in court — he’d instead travelled to Cuba where he pleaded no wrongdoing with journalists who tracked him down. With a warrant now against him, he travelled Europe as a refugee, using the Austrian passport he had gained through his philanthropy. Authorities caught up with him in Berlin’s Tegel Airport, and after six months in a German prison he was extradited and imprisoned in New Jersey. He pleaded guilty to a charge of tax fraud and was handed an 18-month sentence, of which he served 16 months. He was also fined $40,000. This was far from the first time that Axelrod had engaged in legal antics. As early as 1965 he’d already been sued 14 times. His strategy was to countersue, and he almost always won. Only his first case, involving the unauthorised use of images taken by William T. Innes in a TFH-published book was lost by him. Even here, the case left him relatively unscathed — Innes was awarded almost nothing as it couldn’t be shown he’d substantially lost anything. In Axelrod’s own admission, there was a thrill to the litigation process, with winning bringing him, it was said, as much joy as the discovery of a new species of fish. As an individual, Axelrod — ‘Herb’ to his friends — garnered both admiration and resentment from the fish world; perhaps it’s a sin to be financially successful in aquatics. Numerous rumours and allegations surround his fishy antics — none of which come backed with evidence, however. Indisputable is the enormous role he played in forming the hobby as we see it today. While it was stale and tired before the addition of Axelrod, he brought a wealth of colour and variety to fishkeepers everywhere, in print and flesh. One seminal work on the early years of Axelrod’s life refers to him as a ‘panjandrum’. Fast forward fifty years, and that word is replaced with a less than flattering adjective ‘picaresque’. On one of the rare occasions he commented on his own life, Axelrod was on record after his conviction in 2004 as saying: "It was always my goal to be remembered as an outstanding philanthropist. That's all gone. Instead, I will be remembered as a person who disrespected his country, his government, the law and this court. It is the biggest mistake of my life." Whether we remember him as philanthropist or not, his mark on fishkeeping is indelible and one that deserves the widest recognition. Perhaps — just perhaps — he was the singlemost influential fishkeeper the hobby and industry has seen. Get a new Fluval U2 filter worth £46.99 when you subscribe to Practical Fishkeeping! Don't miss out on this great offer. Subscribe to Practical Fishkeeping magazine and get a Fluval U2 aquarium filter worth £46.99! Take out a subscription to PFK and take advantage of this amazing offer. The Fluval U-series of internal aquarium filters have recently undergone a few design tweaks and improvements, based on feedback from the fishkeepers who used them (so top marks there to the manufacturer Rolf C. Hagen for listening). As a result, this best-selling range of filters are now even better — and here's your chance to get a Fluval U2 model (RRP £46.99) when you subscribe to PFK. The U2 filter is easy to use, quiet running and suitable for fresh or saltwater aquariums up to 110 l.
You can read Nathan Hill's review of the new U-Series filters here. You can subscribe for just £31 for 13 issues if you go digital; £50 for the printed magazine option — or get both print and digital for £55. So click right here to subscribe today and receive your complimentary Fluval U2 filter. This offer closes on May 9, 2017. What are you waiting for? The May issue of Practical Fishkeeping is on sale now! The May issue of Practical Fishkeeping comes with a FREE 16-page pull-out guide to keeping Koi. The May 2017 issue of PFK is packed from cover to cover with gorgeous fish — some you’ll be familiar with, others you might not be. Our cover star is the tiny Dwarf puffer — a fish with considerable character for its small size and which will quickly become a favourite with the whole family. Find out how to keep — and even breed — these pea-sized fish inside. Our fish of the month is the Bleeding heart tetra. Find out just why these fish are one of Peru’s greatest tropical exports. Check out some new fish we came across in the shops lately — and the return of an old favourite with pleco fans. We have inspiration with a reader’s Pantanal-themed aquarium, plus a striking Indian-inspired planted tank for smaller spaces, and you can find out how a group of piranha got a shiny new aquarium for a shop display. Red-spotted gobies, breeding Corydoras, water hardness made easy — it’s all here! And if you’re new to fishkeeping, we have a brand new beginner’s section to help you out. Marine fishkeepers can find out how to win the nuisance algae battle, there’s a spotlight on some of the more aquarium friendly damsels — and if you’d like to spend more time just sitting back and enjoying your marine tank, meet a reader who, despite a huge aquarium, is using a system that lets him do that. We compare two of the most popular pondfish in a face to face, head to hood battle, there’s advice on keeping disease at bay in your pond this year — and did we mention the free 16-page beginner’s guide to Koi keeping pull-out? We did say it was a packed issue! Don’t forget you can now buy the latest issue of Practical Fishkeeping online (with free postage) as well as in the shops. Click here for more details. Or why not take out a subscription to PFK and take advantage of our great welcome gift — a new Fluval U2 underwater filter, worth £46.99! Click here to find out more. First cave dwelling callichthyid described! It’s the Aspidoras you’ve never seen, and probably never will – but that cuts both ways! It lives in caves underground and lacks eyes, and for years it’s been described as the wrong fish. Now icthyologists Luiz Tencatt and Maria Bichuette have given it a name of its own. Meet Aspidoras mephisto, the first troglodont callichthyid. In a paper published on March 1st, titled “Aspidoras mephisto, new species: The first troglobitic Callichthyidae (Teleostei: Siluriformes) from South America,” Tencatt and Bichuette explain how the fish, known for years as a cave-transitional form of Aspidoras albater turns out not to be that fish at all. Comparing multiple epigean (above ground) specimens with the hypogean (below ground) form, the duo was able to refute any claims of A. albater heritage. Aspidoras are the ‘little brothers’ of the Corydoradinae, physically smaller than their Corydoras and Scleromystax ilk. If you’ve dissected them and have microscopes to hand, then you can tell the difference by looking at bones in the skull – the supraoccipital fontanel to be exact. If you’re not prone to pulling fish apart, then identify Aspidoras the way I do – if it’s smaller than a typical cory, has a longish body, and beady little eyes, it’s probably an Aspi. Aspidoras mephisto takes the small eye thing a step further. Being a cave dweller, it has little use for vision, and so eye development is severely retarded. Unlike other well-known ‘cavies’ like the Mexican cavefish which just do away with eyes altogether, A. mephisto can come in many eye ‘flavours’. Where the eye is visible, it may or may not have a lens. It may be obscured by a shrunken orbit and skin growth closing over the top of it, or it may be covered altogether. Its colours are mainly white-yellow or white-pink, but with a few translucent parts as well. It’s a distinctly washed out version of other Aspidoras, with grey brown blotches typical of the genus, black eyes and a green iridescence over the whole body. It’s subtly pretty. Aspidoras is pretty meh as names go. ‘Aspis’ simply means shield, and ‘dora’ means skin, and it’s all a play on the armoured bodies these little cats have. Mephisto is a bit more fun, though. It comes from an old Germanic folklore demon, Mephistopheles, a character trapped in hell for selling his soul to Satan. If that name is derived from Hebrew, then it makes little sense to the fish (it kind of means ‘plasterer of lies’ in that translation), but if it’s of Greek origin, then it’s a literal negation of light loving – ‘me’ (negation, or not), ‘phos’ (light) and ‘philis’ (loving). Short answer: it’s named after a demon. How cool? It’s only found in the Anesio-Russao cave system in the upper Rio Tocantins basin, Brazil. It lives in shallow (less than 50cm deep) slow moving waters, over substrates of boulders, clay and silt. The Anesio-Russao system is a limestone karst formation with outcrops all over the place though generally hidden by vegetation. It experiences a 5 or 6 month dry period followed by a wet season. At the beginning of the dry season, water conditions there were: 7.8pH, conductivity 0.514mS.cm, dissolved oxygen 3.9mg/l, and temperature 22.3°C. By comparison, above ground at that time the water was softer (conductivity 0.248mS.cm), warmer (26.7°C) and more acidic (6.9pH). It’s already threatened, courtesy of urban growth. Deforestation and sewage is impacting the caves, as well as the ever present South American mining enterprises. It lives in pretty dense populations compared to other cave dwellers, with 5 or 6 individuals found in every square metre of footprint. There’s some root encroachment on their territory (they’re not necessarily deep down in the cave) and the juveniles use these roots for cover. Like other callichthyds, they forage about in the substrates at about a 60° angle. Some are, some aren’t. A lot depends on the level of eye regression, but it’s interesting to note that they’re either unsighted or unruffled – they showed no aversion to lamps in the caves, nor the observers watching them. As already mentioned, the eyes can be at various stages of regression, but how much they even use them is open to some debate. Live uncatalogued specimen of Aspidoras mephisto from the Anésio III cave, Posse, Goiás, Brazil. Image copyright Danté Fenolio. Tiny, like other Aspidoras. The holotype of the species is 45.6mm long, and it appears the size ranges for adults caught vary from 18.8mm to 45.6mm. A curious offshoot of troglodont lifestyles is longevity, and A. mephisto seems to be no exception. The captive holotype (retrospectively identified – they’d have been honorary A. albater before) caught as an adult back on April 7th, 2007 stayed alive until its preservation in April 2016 – a nine year minimum adult lifespan! Tencatt and Bichuette propose that the fish should be considered Endangered already, for a few reasons. They’re only known from 5 locations over a 500km2 area, and the habitat they’re known to be is showing gradual decrease from encroachment. The presence of sewage affecting the caves, and a lack of legal protection for them, both suggest that A. mephisto could easily shift into the Critically Endangered category real soon. How rare are they in the hobby? You’re not going to see them any time soon, that’s for sure. If you’re the kind of person who loves scientific papers, then you can find the original below. If words like ‘sphenotic’, 'epiphesial’, and ‘ceratobranchial’ get you excited then go have your fill. It isn’t light bedtime reading, but the images are pretty cool. Photo credits: Danté Fenolio, Luiz Fernando Caserta Tencatt, Maria Elina Bichuette, PLOS one and Creative Commons.